Heartland sometimes receives semi-social/semi-feral cats or cats with behavioral issues (i.e., inappropriate urination) that make them unsuitable candidates for adoption into family homes. Our Working Cat Barn Program was developed for the purpose of finding homes at barns, warehouses, farms and other safe locations for cats that have been determined to be not fit for our standard adoption program for indoor pets. Barn Cats provide numerous benefits to their caretakers and environment! They offer safe and cost-effective control of rodent populations without the use of poisons/pesticides for children and pets to get into, or the need to set annoying and nasty traps. Not only will they keep the rodents away, but you will have the rewarding experiencing of saving a life by providing them with a safe and caring home. Providing a warm, secure, dry building or space for shelter from the elements and predators is essential. The space and ability to keep new Barn Cats confined to a sheltered, small, enclosed area or large dog crate (with clean litter box and food/water) for up to three weeks to acclimate them to their new environment before release. Willingness to vaccinate the cats once every three years (by trapping, if necessary) and provide licensed veterinary care in the event of severe injury or illness. Most of the cats that we place into our Working Cat program have not been socialized around people, so they are likely to be aloof and skittish and will avoid contact with humans. All they want from you is safe shelter and a regular food/water source; otherwise, they’ll mind their own business and focus on their job at hand - rodent patrol. It’s unlikely that people with allergies will be affected by these cats as they live outside and prefer not to come in contact with people. Over time, they may become a bit more social once they build a rapport with the people they are familiar with, but each cat is different and their comfort level with people will vary. While we do not assess an actual adoption fee for our Barn Cats, we do appreciate donations in any amount to help us cover the costs associated with vetting and care of our animals. NOTE: Heartland typically adopts out barn cats in pairs, so each Working Barn Cat adoption includes two cats. 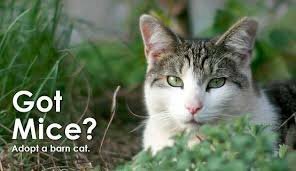 Single barn cats may be adopted out on a case-by-case basis to barn homes that already have working cats, or if the barn cat needs to be in a single-cat environment. Number of adults in home? Children? Living accommodations- house, trailer, apartment, condo, farm, etc. Do you live here full-time? How far from road is barn located? Why do you want barn cats? Do you have a preference of feral, semi-social or friendly cats? (Feral = wild and/or unsocial; untouchable and will hide from people; may be aggressive if cornered but make excellent hunters. Semi-feral = undersocialized, may allow touching but not handling; will likely hide from strangers and may be unpredictable. Semi-social = with work, will likely allow touching and possibly handling; usually scared of strangers but may bond with family members over time. Social = friendly cat, will allow handling; may prefer to be indoor/outdoor). NOTE: we only place friendly barn cats if they have behavioral issues such as inappropriate urination that make them unsuitable candidates for adoption. Describe the structure in which the cats will live/have access to at all times. Barn cats must be securely confined in cages/areas for 3-4 weeks to allow them time to acclimate to a new home. Are you prepared to do so and give them this much time to settle in? How will you confine them? Are you willing and able to provide them with fresh food and water daily? Do you agree to trap and take to the vet if they become ill or injured? Who will be responsible for the barn cats' care? Who will care for your barn cats if you are away? What will you do with your barn cats if you move? Please list pets you currently own: Species/breed, age, gender, spayed/neutered, indoor/outdoor? If you have a dog, is it permitted to run loose? If yes, what provision will you make to protect the cats? Do you have farm animals that reside on your property? If so, what type? Name and phone number of your small animal veterinarian. Name and phone number of your large animal veterinarian. By signing below, I certify that I have read the above information carefully and have completed the application honestly and the information is true. I understand that omission of information or failure to answer all questions honestly can result in this application being denied. Also, if an omission or untruth is discovered after an adoption takes place, I understand that Heartland Humane Society of Missouri reserves the right to annul the adoption agreement and reclaim the animal. I give HHS permission to fully investigate the information provided as well as contact veterinarians and related officials.